To investigate the possibility of paranormal activity. One of our team came across this location in 2005 and developed a fascination about the place. After making their own enquiries they were able to gain access for our group. We had the opportunity to conduct a brief investigation in December 2005 (see previous report). To our knowledge this location had no reported activity other than the odd banging door heard by the overnight security guards whilst on they're round's checking the building. The previous investigation certainly showed the team that there was an odd feeling around the place, and we felt that should the opportunity arise we should conduct a more fuller investigation. Regrettably, despite having done extensive research, it is not possible to include any detailed history in this report as this would aid to identify the location. The team had no prior plan for the evening and agreed initially to walk throughout the building before deciding on the way forward. Once this was done it was decided to conduct a series of vigils in areas chosen by the team members, based on what they had sensed during the walk around. In addition to this DM-20 Dictaphones were placed in 2 rooms one along the top corridor and one along the bottom corridor. A trigger object being a bell hanging in the roof space. After a brief exploration we decided to hold the second vigil in a small room within the annexe attached to the main building. After a few minutes where we all called for spirit Ian is calling when he feels a tickle on his head followed by Sarah, Rick and Dean complaining of being unable to catch their breath? Sarah seemed to be particularly affected by this and was also feeling sick and light headed! She had called for spirit first. Dean then feels a much more heavy touch on his head, which caused him a bit of concern. After this we chose to switch to another small neighbouring room within the annex and continued the vigil. We carried on for a while, calling for spirit, and agreed there was something about the location and that something was present, but we were unable to discern what. We felt this could possibly be due to there being a number of individuals involved so no clear single and distinct sensation could be felt. After a while longer we moved on. 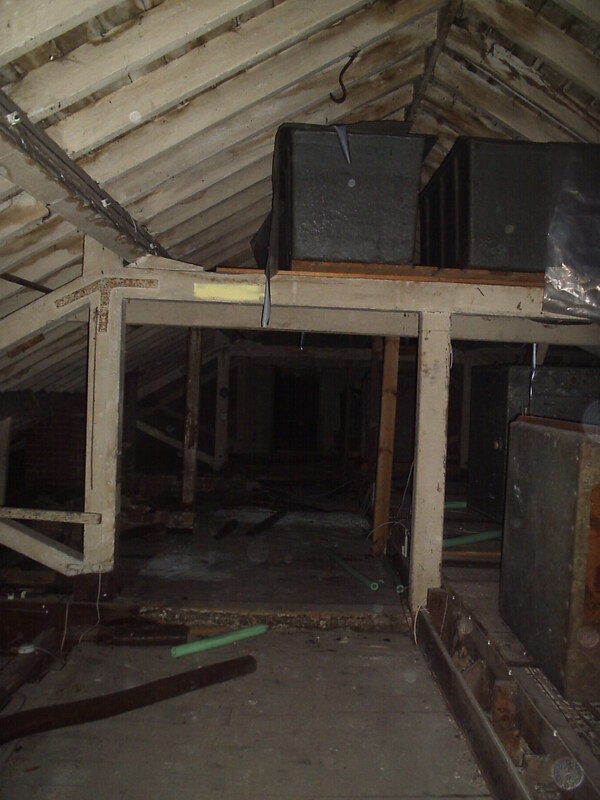 Our third vigil was to be held in the large attic area, which we were drawn too on our last visit. 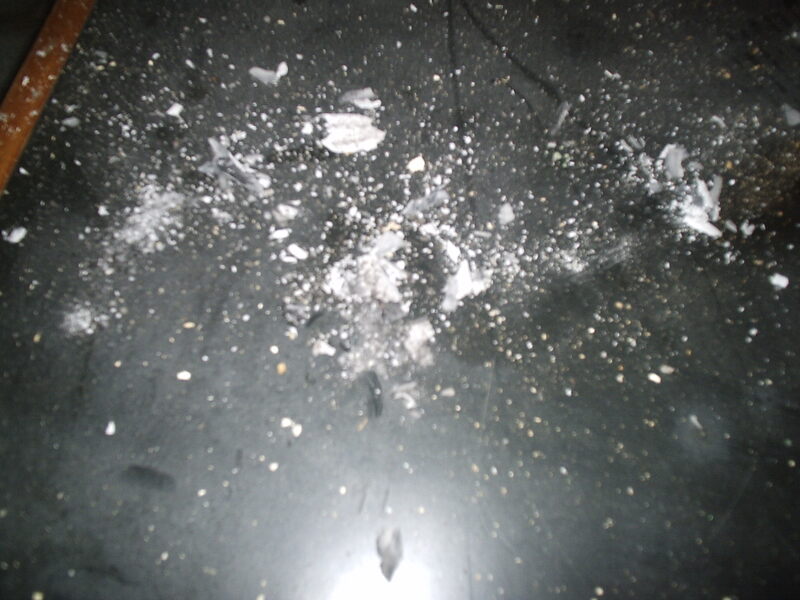 As we entered we saw an odd thing being some ash from something being burnt on the floor, this was not there a month before and we could see no explanation for it? We began a vigil calling for spirit before venturing further into the attic space, which ran all along the length of the building. Sarah was bothered by and felt there was something standing in the area of the door into the loft. Rick, Paddy and Dean all heard what sounded like faint footsteps at one point that were picked up on Ian's video footage. 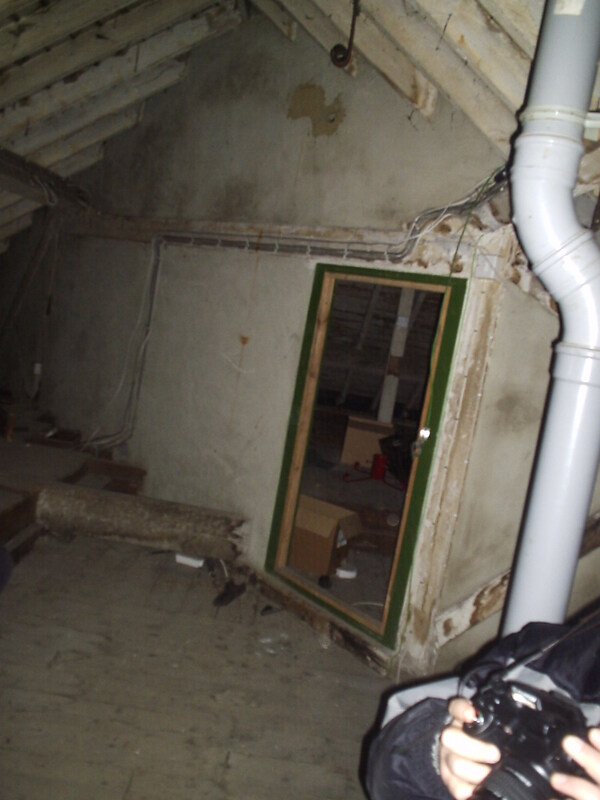 We continued to call for spirit with no apparent results so after a while chose to explore the attic from section to section through the fire doors before deciding to leave and return to camp for a break. The video footage ends as Ian leaves the loft but immediately after this, while Paddy and Rachel were further behind, the last of the fire doors (closest too us) swung shut with a loud bang. We all ran back to investigate and having examined this extremely heavy door, we could see no reason how it could have swung so furiously without being pushed shut? This unnerved us a bit so we went swiftly into a break. After the break we split into two smaller groups for our last vigil of the night, the groups being Ian, Paddy, Rachel and Dean, Rick & Sarah both groups chose a location within the building to conduct a smaller more personal vigil but there were no results to report. Our last act of the night was "The long Walk"! We discussed this at Rick’s suggestion as we were packing up the investigation, and it sounded fun, if not scary! From our base camp at one end of the building there was a long corridor to the disused main entrance, which continued from there to the other end of the building! We decided to walk one at a time, alone, to a room at the far end of the other wing of the building where we would then discuss our experiences. Paddy went first and waited alone for someone to join him at the other end of the building. We all followed on in succession till we were all assembled at the other end of the building with some unusual experiences to share. 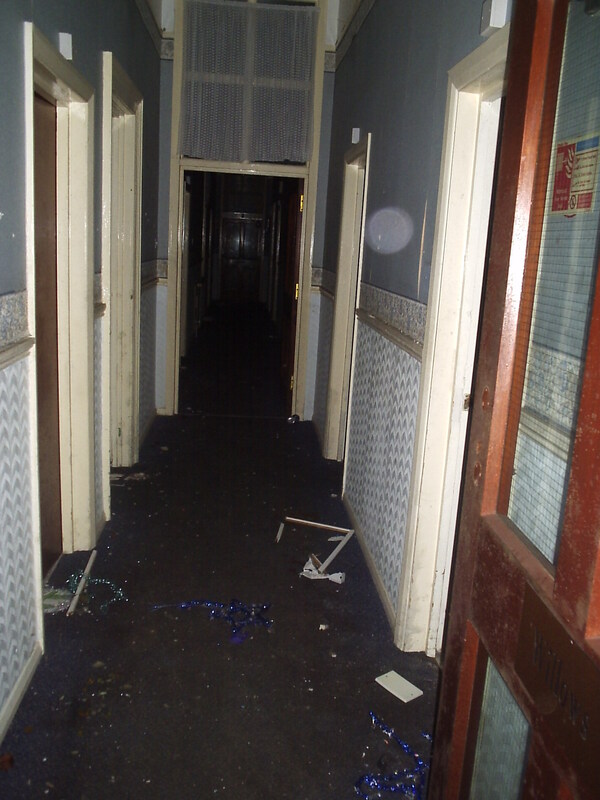 Dean had jumped out of his skin after thinking he saw a figure standing near the disused entrance, Ian had felt a sudden presence and possibly a tug on the arm as he approached this same area, Rachel had been startled by something, again in the same area. The others all felt uneasy doing the walk but with nothing specific to comment on. This sort of experiment had not been done before and was fun doing so this will be tried again, venue permitting. The evening was not full of spectacular results, but certainly earlier on in the investigation there was a definite sensation that there were spirit presences at this location, some may be that simply were not willing to show themselves. 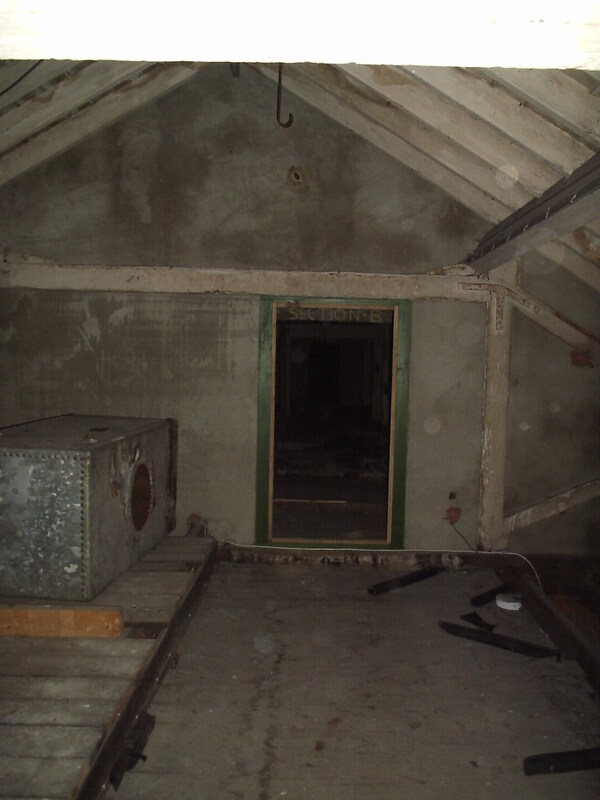 The attic fire door slamming and the possible footsteps heard do certainly add weight to the fact that the attic would be in contention to be possibly the most paranormally active space in the building. Knocks, bangs and clicks were heard but this could simply be building movement or the elements. A lot of the feelings we felt that night could simply be the teams nerves playing with them, as this certainly is the sort of place that has an eerie feeling about it. Nothing was caught in video apart from things previously mention, and nothing was captured photographically or by EVP apart from one thing. One loud tap was picked up on Rick’s DM-20 as though something touched the microphone? Was some having a poke with this wondering what it was? We feel that this place certainly has more to offer and further investigation is required, sadly the place is on the market for redevelopment so it is unlikely the opportunity will arise. Nothing that we encountered could be called paranormal as there are always normal explanations either by building movement contracting or expanding, drafts causing doors to slam and other noises can be explained as other natural phenomena. Any feelings and sensations felt by the investigating team could simply be the effect of dark empty building playing on our senses. 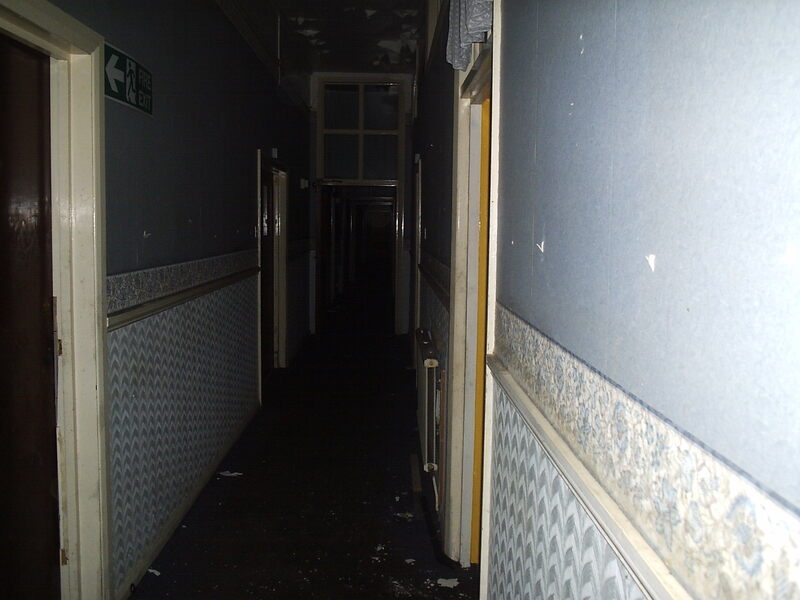 Nothing that occurred on this investigation could be called as paranormal.